i love thumprint cookies. 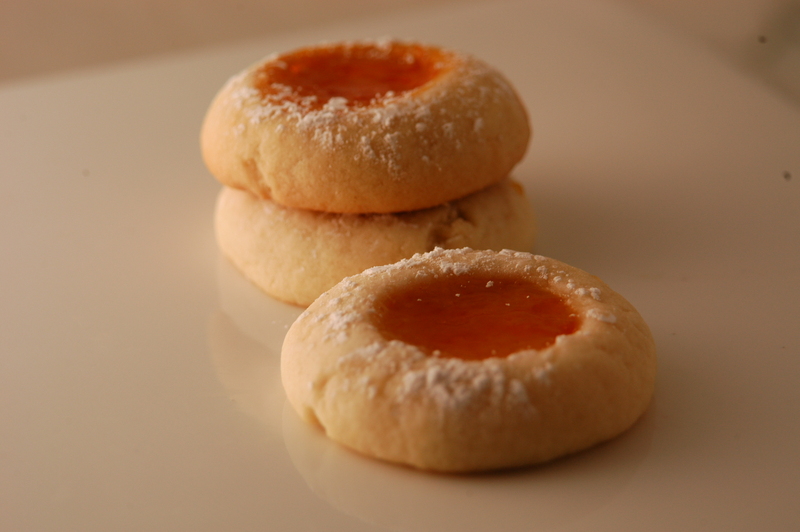 the buttery flakey tender cookie offset by the tart, sweet gooey jam. so absolutley delightful. i will make a huge batch of these yummy treats and i would say about 80% come out near-perfect in appearance. the other 20% come out a little funky looking. the raspberry jam sometimes bleeds into the cookie looking messy, or it spills over the top of the cookie. there seems to be two schools of thought on making the jam filled thumbs…one is to fill with jam and bake. the other is to bake halfway, then fill and then finish baking and thirdly bake completely and then fill cooked cookie with raw jam. I have tried the first option- (this is what I usually do bake the jam right into the cookie) this allows the jam to cook and set, so that it is not “sticky” and messy. this allows for easy stacking and transporting. I tried the last option as well, but then the “raw” jam gets messy and you cannot stack cookies… I have yet to try option number 2… I will try and report back. they are so quick and easy, you will have fun making them and eating them! Preheat oven to 350. In a large bowl, using an electric mixer, beat butter and sugar until smooth. Add egg, and beat until completely combined. With mixer on low, add flour, and mix just until incorporated. Shape dough into 1-inch balls (about 2 tablespoons each). Place on baking sheets, at least 3 inches apart. Moisten thumb with water, and gently press the center of each ball, making an indentation about 1/2 inch wide and inch deep. In microwave or on stove, heat jam until liquefied; spoon about 1/2 teaspoon into each indentation. Bake until cookies are golden brown around edges, 18 to 20 minutes. Transfer to a wire rack, and let cool completely. If storing, place in an airtight container at room temperature, up to 2 days. Thanks for this recipe. I’ve never made thumbprints, but these look so cute!